This is a screen capture from the Old Spice Branding Campaign. We are often asked about our brand development strategies. It’s a great questions, since branding is a time-intensive, mission-critical endeavor. How do you know the right thing to do? It often begins with an intuitive gut feel. For instance, in rebranding, it could be “Wow, I feel like we lost the excitement.” A totally new brand may start as one idea, but when you test it out with your customers, it may evolve into another. Needless to say, you put a lot of time and effort into your brand. But times change. Attitudes change. And the economy definitely changes. The market is always changing. And so will your brand. An important note: Branding is not just about your logo. Company branding includes your logo with the focus on what your audiences take away from what you project in your communications. With so many channels to communicate with you audience, your brand must be well defined and consistent in all channels. That way, you audience does not become confused about who you are. It’s just like a game of football. Do you want to make a few quick yards with a ground game? Or do you go long with a pass to the end zone. This depends on your sense of urgency and the amount of relevant brand equity you have built. Whether you’re a start-up or a Fortune 500, you’ve got to do your homework. Brand Invention – For a startup that hasn’t established a brand yet. You need a clean slate, so you should define everything. What’s your company personality? How do you relate to your customers? Most importantly, what do you want to be when you grow up? Project where your company will be in 5 years and use that as a sounding board for all the branding ideas that you come up with. Make sure that your new brand matches that goal. Think Uber. Such a simple idea. And the brand conveys that simplicity. 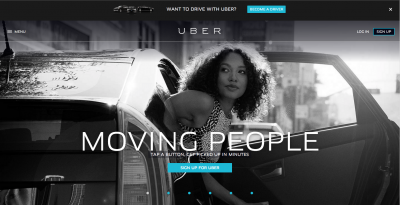 Uber has done a sensational job of articulating their brand message simply and quickly. It’s not just about a logo. It’s so much more. Brand Evolution – For a company with an established brand that has built a solid relationship with customers. You’ve put a lot of hard work into your business. Your brand has been established. Do you want to shake things up? Do you want to reinvigorate the relationship. With this approach, you need to leverage all the good branding points you have scored with your customers. This is a gentle, subtle shift. Your customers will notice, and if done right, accept. A great history is the evolution of the Prudential logo. Prudential is the quintessential brand evolution story. This is a collection of Prudential logos that represent the stages of brand evolution undertaken by Prudential. This is a classic design school study that is worth revisiting. Brand Revolution – For a company that has a well-established brand and needs a major dose of excitement. Now you really want to shake it up. Things have changed. Most often, it’s a new generation of customers. With different expectations and tastes. They may still enjoy the benefits of your product, but they want it packaged in a way that makes them feel like it’s their generation, not their parents. Before you put a pencil to paper, or a mouse to pixel, make sure that everyone is on board with the strategic direction. It may seem like a really simple choice. Believe me. It may lead to days of discussions and lots of good customer research. Now you know the basic answers for “How to Brand Your Company.” Done right, you’ll have a solid foundation for developing an effective new brand.